Since it landed on August 6th, 2012, the Curiosity rover has spent a total of 1644 Sols (or 1689 Earth days) on Mars. And as of March 2017, it has traveled almost 16 km (~10 mi) across the planet and climbed almost a fifth of a kilometer (0.124 mi) uphill. Spending that kind of time on another planet, and traveling that kind of distance, can certainly lead to its share of wear of tear on a vehicle. That was the conclusion when the Curiosity science team conducted a routine check of the rover’s wheels on Sunday, March 19th, 2017. After examining images taken by the Mars Hand Lens Imager (MAHLI), they noticed two small breaks in the raised treads on the rover’s left middle wheel. These breaks appeared to have happened since late January, when the last routine check of the wheels took place. To get around, the Curiosity rover relies on six solid aluminum wheels that are 40 cm (16 in) wide. The skin of the wheels is thinner than a US dime, but each contains 19 zigzag-shaped treads that are about 0.75 cm (three-quarters of an inch) thick. These “grousers”, as they are called, bear most of the rover’s weight and provide most of the wheel’s traction. Ever since the rover was forced to cross a stretch of terrain that was studded with sharp rocks in 2013, the Curiosity team has made regular checks on the rover’s wheels using the MAHLI camera. At the time, the rover was moving from the Bradbury Landing site (where it landed in 2012) to the base of Mount Sharp, and traversing this terrain caused holes and dents in the wheels to grow significantly. In addition to regular monitoring, a wheel-longevity testing program was started on Earth in 2013 using identical aluminum wheels. These tests showed that once a wheel got to the point where three of its grousers were broken, it had passed about 60% of its lifespan. However, Curiosity has already driven more than 60% of the total distance needed for it to make it to all of its scientific destinations. At present, Curiosity is examining sand dunes in the geographical region known as the Murray Buttes formation, which is located on the slope of Mount Sharp. Once finished, it will proceed up higher to a feature known as “Vera Rubin Ridge”, inspecting a layer that is rich in the mineral hematite. From there, it will proceeded to even higher elevations to inspect layers that contain clays and sulfates. Getting to the farthest destination (the sulfate unit) will require another 6 km (3.7 mi) of uphill driving. However, this is a short distance compared to the kind of driving the rover has already performed. Moreover, the science team has spent the past four years implementing various methods designed to avoid embedded rocks and other potentially hazardous terrain features. It is expected that this drive up Mount Sharp will yield some impressive scientific finds. 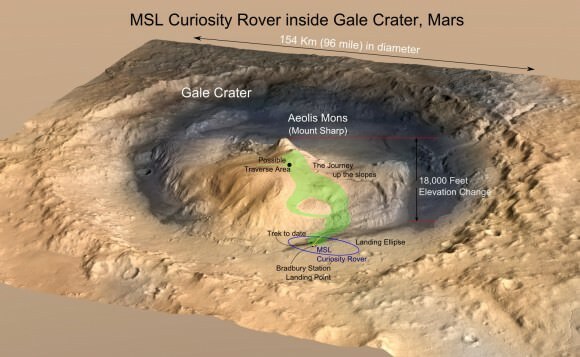 During its first year on Mars, Curiosity succeeded in gathering evidence in the Gale Crater that showed how Mars once had conditions favorable to life. This included ample evidence of liquid water, all the chemical elements needed for life, and even a chemical source of energy. By scaling Mount Sharp and examining the layers that were deposited over the course of billions of years, Curiosity is able to examine a living geological record of how the planet has evolved since then. Luckily, the rover’s wheels seem to have more than enough life to make these and (most likely) other scientific finds. After that initial scarring near Bradbury, I was really nervous about the longevity possible. Good to hear this later stage positive assessment! Previous PostPrevious Why Doesn’t Earth Have Rings?